Sen. Jeff Flake announced Friday morning that he would vote to confirm Brett Kavanaugh to the Supreme Court, and he was immediately confronted about his decision. 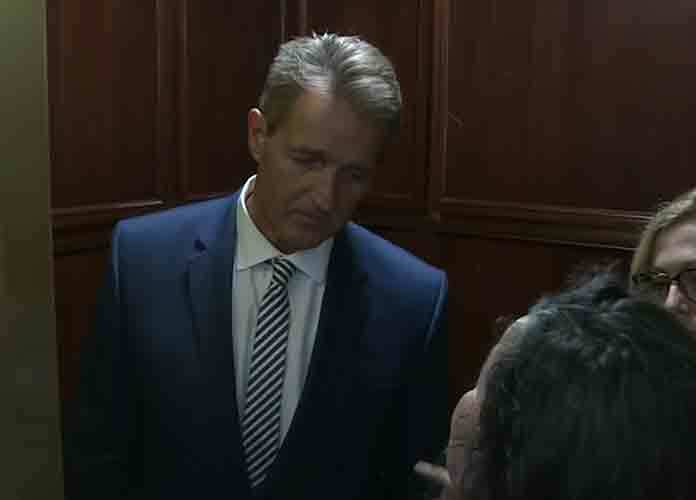 Two women, both of whom are sexual assault survivors, approached the Arizona Republican in a Senate elevator and, crying, blasted him for not supporting women like themselves and Dr. Christine Blasey Ford, who testified alongside Kavanaugh on Thursday before the Senate Judiciary Committee. “Don’t look away from me,” the woman continued as Flake stood mute. “Look at me.” Sadly, the senator did not respond to the women’s statements and simply said he need to get to the day’s hearings. Flake said “thank you” and referred people to his statement. Flake, who is not seeking re-election this year, is an ally of President Donald Trump who was considered a key swing vote for Kavanaugh’s confirmation. Two other GOP senators who are moderates — Alaska’s Lisa Murkowski and Maine’s Susan Collins — are also viewed as crucial to determining whether or not Kavanaugh will be confirmed. A vote to confirm Kavanaugh has been scheduled for 1:30 p.m. EST on Friday.